In the thought of Maurice Merleau-Ponty, mediational theories, which deny the possibility of a direct, pre-predicative relationship with the world, and whose pervasive and insidious influence continues to exert control on a variety of levels over the sciences of man, are rejected and replaced by a philosophy which posits man as fundamentally and irreducibly connected to the world in primordial, natural and, most importantly, unmediated ways. In La Phénoménologie de la perception (Phenomenology of Perception), Merleau-Ponty reveals the dialectic that exists between intellectualism, or idealism, and empiricism, two systems of thought that, upon first appearance, seem diametrically opposed. Intellectualism, and the inevitable scepticism that emerges as its result, and the tendency of the sciences towards the objectification of phenomena, are shown to be untrue to man’s lived, embodied experience of the world. For Merleau-Ponty, man is, as Heidegger says, essentially being-in-the-world (In-der-Welt-sein). We are involved with the world in unmediated, non-conceptual ways. In the films of Stan Brakhage, we find a sympathetic and compatible cinematic analogue to Merleau-Ponty. Brakhage gives us phenomenologies on celluloid. He recognizes the vital importance of perception, its function as the locus of the meaning that we can take from the world. Many of Brakhage’s films may be understood as essentially pre-predicative, with vibrant colours and amorphous shapes reaching out to and beckoning the viewer in manifold, non-discursive ways. Simply put, Brakhage wants us to see. At times, his attempt is to convey something essential about a subjective experience in non-conceptual ways, such as the emotion of anger in Rage Net (1988), or the confusion and terror that menace us in Black Ice (1994). At other times, the emphasis is placed simply upon transporting the viewer into a world, with Brakhage attempting to allow his audience to experience these worlds without the projection of mediating concepts. In keeping with Merleau-Ponty, Brakhage recognizes the primacy of first-person experience. Moreover, he recognizes the limitations of cinema that emerge as a consequence of such a realization. In what follows, I will examine the intellectual kinship that exists between the phenomenology of Merleau-Ponty and Brakhage’s unique cinematic vision. This position stands in opposition to the basic principles of idealism and empiricism. The former argues for the existence of a mediating ego which immanently constructs the external phenomena which it perceives, while the latter posits an objective, third-person perspective from which to conduct causal investigations of worldly phenomena. Merleau-Ponty finds in Gestalt psychology a potential remedy for these modes of inquiry, both of which he argues are untrue to man’s lived experience of the world. For the Gestaltists, perceptions are neither constructs of an inner ego nor simply independent units perceived and synthesized by the retina. They are, instead, structured wholes in which the meaning of the individual percept is dependent upon the larger context of which it is a part. It can thus be said that Brakhage shares Merleau-Ponty’s understanding of matter as being fundamentally “‘pregnant’ with its form” (5). In other words, there is, in the phenomena that we perceive, always already a resonant meaning which exists in the thing itself, prior to any subjective, discursive act of cognition (judgement, intellectual synthesis, etcetera) on the part of the perceiver. For Brakhage and Merleau-Ponty alike, perceived entities fundamentally have meaning for us as a direct result of our essentially embodied, lived situatedness within the world. Brakhage’s films allow the inherent, essential meaning common to all perceived phenomena to become manifest and to radiate without predication. We note that, for Merleau-Ponty, one essential attribute that distinguishes the painter from other artists is that “only the painter is entitled to look at everything without being obliged to praise what he sees” (6). This distinction may be applied to Brakhage’s work as well. His lens remains resolutely reticent, even in the face of the enduring tendency of filmmakers to pass judgement, either implicitly or expressly, upon their subjects. A profound example of this restraint may be found in The Act of Seeing With One’s Own Eyes (1971). Brakhage surveys the bodies in the coroner’s offices from the vantage point of a non-judgmental, largely passive observer. However, this is not to say he is detached from what he perceives, for he cannot be detached. The state of affairs with which he is presented simply cannot cease to be significant for him; his embodiedness within the world and his fundamental mode of being as being-with-others forbids it. As Merleau-Ponty notes, “the most important lesson which the [phenomenological] reduction teaches us is the impossibility of a complete reduction.” (7) In other words, when we thematise phenomena, we cannot and should not attempt to detach ourselves completely from it; we cannot perceive objects from nowhere, but only from within the world itself. There is a similar recognition of the impossibility of complete impartiality on the part of Brakhage and, in fact, the film itself thrives upon it. Brakhage wants us to see the lifeless masses not merely as res extensa (extended body) in the Cartesian sense, but as human beings. The bodies that his camera lights upon are charged with a profound, innate meaning that is in no way engineered or manipulated. It is because of our being-in-the-world that the film’s images affect us so. We can thus be justified in asserting that The Act of Seeing With One’s Own Eyes is, at heart, a film about intersubjectivity. 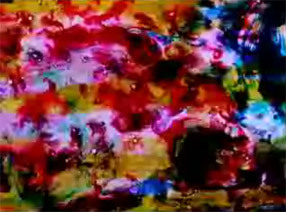 If The Act of Seeing With One’s Own Eyes is a film which projects its viewer into a sort of pre-predicative, deeply meaningful state of affairs, Rage Net and Black Ice, two short painted films, are works which attempt to convey something essential and personal about some of Brakhage’s own subjective experiences, and to do so in a non-discursive, pre-reflective fashion. The former concerns itself with the emotion of anger, specifically Brakhage’s own resentment and regret over his failed first marriage. Visually, it is a wash of iridescent, spiralling colour forms collapsing in upon one another before exploding outwards, morphing into even more brilliant colours and fragmented patterns. Brakhage’s treatment of rage occurs entirely from a pre-predicative perspective. His aim is not to re-present the emotion of rage, so much as embody its essence by way of these abstracted images. It is an attempt to depict his own subjective, first-person experience of rage, to present to the viewer a non-discursive, cinematic phenomenology of anger. The images in Black Ice are at once ominous and beautiful, conveying a sense of falling through endless, disorienting layers of kaleidoscopic colour and a dense void of all-permeating blackness. The film is similar to Rage Net in what it endeavours to achieve: a non-conceptual, visual representation of a subjective experience. Both films are possessing of what Merleau-Ponty calls a “gestural” significance. (9) They do not seek to objectify their subject matter, and the premium is placed not upon representation, but upon the extraction and expression of the essence of these emotional experiences. There is, in all three of the films mentioned above, an awareness on the part of Brakhage of the fundamental limitations of film as an artistic medium. 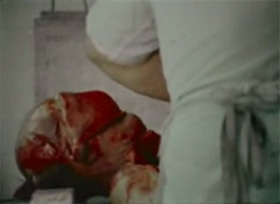 In The Act of Seeing with One’s Own Eyes, Brakhage attempts to throw his viewers into a specific state of affairs, to make us see with our own eyes these images of utter human mortality that he has filmed. Similarly, Rage Net and Black Ice seek to convey something of the essence of two of Brakhage’s own personal experiences, to allow us to experience something which he himself has subjectively undergone by way of gesturally significant, non-conceptual images. Speaking directly about film, Merleau-Ponty tells us that “the screen has no horizons” (10). In other words, in the realm of cinema, the phenomenal field that the viewer perceives is, in essence, controlled by the filmmaker. In normal perception, it is the subject who directs his gaze upon specific percepts within the phenomenal field. When we focus upon an object, it becomes disclosed to us more clearly, and the other objects in our field of vision “recede into the periphery and become dormant” (11). This is not to say, however, that they disappear. The context in which a percept is irreducibly situated never ceases to be an issue for us, even as we train our eyes upon a specific detail within our field of vision. Conversely, in film the phenomenal field is circumscribed by the limitations of the camera. There is no horizon, or larger context, of which the images we see are a part; there is only the image on the screen – an image that is, in effect, cordoned off from the world by the filmmaker. Films such as Black Ice and Rage Net desperately attempt to transcend this fundamental limitation of the medium. They do not necessarily direct us at anything in particular but rather attempt to leave the constrained phenomenal field of the screen open, so to speak, to the viewer’s own subjective intentionality. However, despite Brakhage’s intent, it cannot be said that these two films entirely escape Merleau-Ponty’s critique, for they are ultimately still subject to the fundamental limitations of which he speaks. Brakhage himself recognizes these limitations and, even though he cannot completely overcome them, he presents us with films that strive to possess something like a horizon. Brakhage’s works embody many of the important themes of Merleau-Ponty’s phenomenology. His films are unique in that they operate primarily within the realm of the pre-predicative, the non-discursive and, often, the pre-conceptual. Both Merleau-Ponty and Brakhage alike advocate the importance of thematising phenomena from the first-person perspective of the embodied subject. 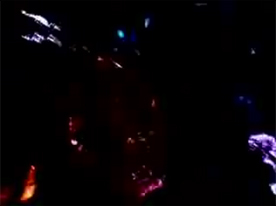 Moreover, Brakhage’s resistance to linear, narrative-driven techniques is in some ways analogous to Merleau-Ponty’s rejection of the modes of inquiry put forth by intellectualism and empiricism. Whereas Merleau-Ponty rejects the notion that the world is either a projection of the transcendental ego or a quantifiable object, Brakhage refuses the creative impulse to project meaning upon his subject matter, or to treat it purely as an object partes extra partes. Thus, Brakhage and Merleau-Ponty are ultimately at one in seeking a way to consider the world and phenomena that remains resolutely within the world from the perspective of an irreducibly situated and always involved perceiving subject. Stan Brakhage, “Metaphors on Vision”, in Essential Brakhage: Selected Writings on Filmmaking (New York: McPherson and Company, 2001), p. 12. Maurice Merleau-Ponty, Phenomenology of Perception, translated by Colin Smith (New York: Routledge, 2002), p. vii. Maurice Merleau-Ponty, “The Primacy of Perception”, translated by James M. Edie in John Wild et al (Eds), The Primacy of Perception (Evanston, IL: Northwestern University Press, 1964), p. 12. Maurice Merleau-Ponty, “Eye and Mind”, translated by Carleton Dallery, in John Wild et al, p. 161. Merleau-Ponty, Phenomenology of Perception, p. xv. Stan Brakhage, interviewed by Bruce Kawen, 2002. Merleau-Ponty, Phenomenology of Perception, p. 217. Alex Cobb recently completed degrees in philosophy and English at Xavier University. He is the owner of Students of Decay Records.